THIS BULLETIN IS FOR ALL AREAS OF THE PACIFIC BASIN EXCEPT ALASKA - BRITISH COLUMBIA - WASHINGTON - OREGON - CALIFORNIA. THIS MESSAGE IS FOR INFORMATION ONLY. THERE IS NO TSUNAMI WARNING OR WATCH IN EFFECT. HOWEVER... AT MANZANILLO MEXICO SEA LEVEL FLUCTUATIONS WERE AS MUCH AS 2.6 METERS CREST-TO-TROUGH PROBABLY DUE TO FOCUSING OF ENERGY BY THE EAST PACIFIC RISE AS WELL AS LOCAL RESONANCES. THIS IS TO ADVISE THAT SMALL SEA LEVEL CHANGES COULD CONTINUE TO BE OBSERVED ACROSS THE PACIFIC OVER THE NEXT DAY OR TWO UNTIL ALL ENERGY FROM THIS EVENT IS EVENTUALLY DISSIPATED. THIS WILL BE THE FINAL BULLETIN ISSUED FOR THIS EVENT UNLESS ADDITIONAL INFORMATION BECOMES AVAILABLE. THE WEST COAST/ALASKA TSUNAMI WARNING CENTER WILL ISSUE BULLETINS FOR ALASKA - BRITISH COLUMBIA - WASHINGTON - OREGON - CALIFORNIA. The earthquake moved the island of Sumatra 100 feet. Sumatra is about the size of California. Niavali Beach Hotel is a remote location in a war-torn region. It is one of few remaining hotels. We caught the full ferocity of the waves front on. We were staying in a room on the beach. We had only seconds to evacuate our room as the waves came crashing through the window at amazing speed and strength. We ran to the upstairs room. Within seconds the waves and water was up to our first floor balcony. Suddenly the waters retreated with equal force gutting our room on the ground floor and taking with it even the bath tub. Then the waves came again filling in all round us. It was like we were on a ship in a storm. The waves very quickly receded and we saw the retreating torrents full with furniture beds, fridges, my daughter's paddling pool together with bodies. Looking out to sea we saw that the sea bed was exposed like a desert for about 1 km. There was no sea. It was like the parting of the waves. We made a run for it at this point wadding through the debris. We saw our car wedged in a tree. We ran until reaching some dry land and just running and running. Ten minutes later we heard enormous crashing of waves as the sea came in for the third time - this time crushing and completely destroying the hotel sending huge slabs of concrete flying through the surging waters. Many people in their rooms perished as the first wave hit. There was simply not even seconds to escape. Families in their rooms on ground floor simply got sucked out of their rooms and disappeared. 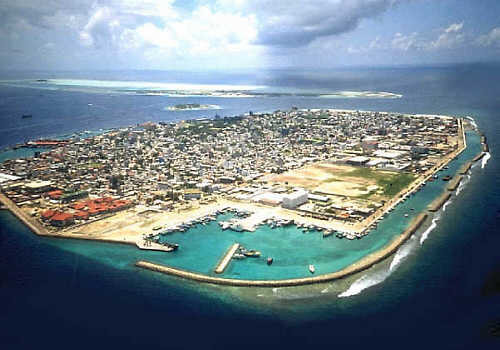 Here's an old picture of Male, the capital of the Maldives. Just a teeming chunk of urbanity crowded onto a tiny bit of coral atoll barely peeking up above the surface of the Indian Ocean. Last I heard, two-thirds of the city is flooded. One thing people aren't paying attention to yet but will possibly mean the end of sustainable life in places like the Maldives: salt. The Romans used to salt the fields of civilizations they wanted to destroy, because it prevents anything from growing for generations. Effectively this is what has happened to much of the agricultural land in the areas affected by the tsunamis. New Zealand Herald reports that in Los Angeles, the head of the Pacific Tsunami Warning Center said US officials who detected the undersea quake tried frantically to get a warning out about the tsunami. But there was no official alert system in the region, said Charles McCreery, director of the National Oceanic and Atmospheric Administration's center in Honolulu. 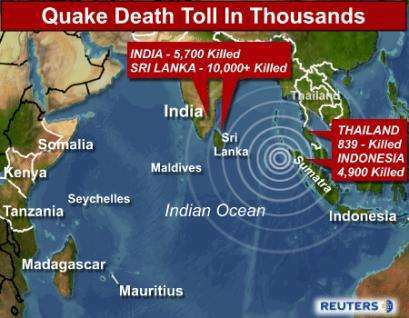 "It took an hour and a half for the wave to get from the earthquake to Sri Lanka and an hour for it to get ... to the west coast of Thailand and Malaysia," he said. "You can walk inland for 15 minutes to get to a safe area." "We tried to do what we could," he said. "We don't have contacts in our address book for anybody in that part of the world."